I, like everyone else in my generation, absolutely love zombie movies. If it has the word zombie you better believe I'm queuing it up. Sometimes they are good, sometimes they are bad and sometimes they are so bad they're good. For better or worse there has been a saturation of the zombie movie sub-genre in the last ten years and unfortunately they can get a little repetitive. 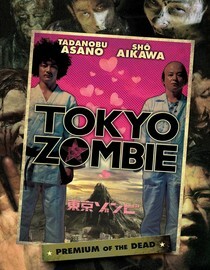 Tokyo Zombie, my fellow zombie lovers, is unique enough to avoid the cliched plot that most follow and stand out from the pack. The Japanese always seem to throw a bit of a crazy spin on anything they touch and zombies are no exception. This movie is more of a buddy comedy than a horror flick. It follows a couple of jujitsu loving slackers without a ton of common sense that have to fight their way through the zombie apocalypse. There were enough funny, crazy and just plain perverted moments to keep my attention throughout the movie, even if did slow down a bit just before the finale. The two friends have a unique relationship and entertaining chemistry that I really enjoyed. This movie falls into the same category as new zombie comedies (or zombedies as I like to call them) like Zombieland and Shaun of the Dead, even if it may not reach the quality of those fine flicks. I do need to warn you that this movie is dubbed instead of subtitled. I usually dislike that, but it didn't really bother me for a silly zombie flick. If you like to have a few laughs while you watch zombies get killed you should give this weird flick a try. According to instantwatcher.com this movie will stream on Netflix until 7/13/11. Why is it in your queue? Because there are zombies. Most memorable moment? The pulsating face towards the end. What mood should I be in to watch this movie? Looking for some good, clean zombie killing fun. Another good foreign zombie flick is DEAD SNOW. Not only are there zombies... they're Nazi zombies. It's been working it's way up my queue. In a couple weeks I'll probably get to it.